We spent the day in Muskegon based on the forecast of 3-5 ft waves. It was a beautiful sunny day but mid morning fog descended on the coast and stayed all day. It was very unusual to see the clouds just stay in the same place all day. A small Navy Marine Museum is nearby so we walked over and toured the submarine and Coast Guard ship there. Both saw service during the second world war. Then we took the trolley downtown. The fare was only $0.25 each. When we got downtown there was a Senior Fair being held in a park and we were given tickets for hot dogs, chips, ice cream, and water for free. All this made for a cheap day. All downtown stores have gone to the suburbs but a number of homes, parks, restored buildings, and apartments remain. The Hackley & Hume Historical Site consists of 3 buildings; two homes and a shared coach house. 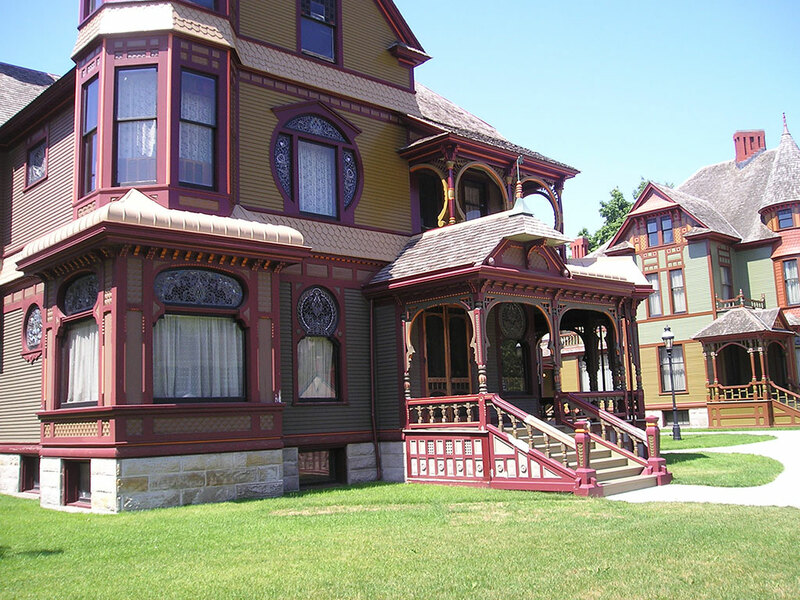 They are wood frame examples of Queen Anne architecture and are the 'symbol of Muskegon'. They were built around 1880 by wealthy lumber barons.